Spring and summer seasons gives us the opportunity to workout outdoors. In the cool morning hours the weather is perfect for an outdoor cardio workout in the park or by the sea beach. In this article I show my choice of a good pair of large size exersize clothes perfect for outdoor locations. The plus size v-neck tshirt is made from a durable material and looks trendy. Both leggings and tshirt provide good coverage to let you feel confident. Large size sportswear should be twice more flattering and durable than any other type of plus size clothing. The following workout active wear articles are suitable for both a day at a gym and a trip to the shopping mall. 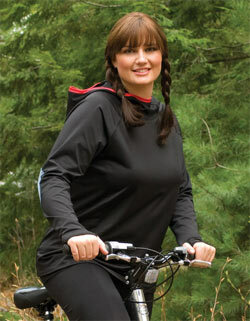 This durable and fashionble top can be combined with a QuikWik® Leggings. The suggested full-length leggings provide maximum warmth and coverage for cold weather running and biking, and also add a fashionable flair worn under skirts and dresses. Our exclusive QuikWik® fabric is endlessly soft and stretchy, moving with your body without binding or chafing. The poly/Lycra blend wicks moisture, dries quickly and is treated with an antimicrobial, odor-resistant finish.